In surrendering the Ashes to Australia, England have been outplayed in all departments of the game. With three defeats from three Test matches, they have not had the answers to Australia's aggressive style of cricket, and now their immediate concern will be to avoid an embarrassing 5-0 whitewash. So what can they do between now and Boxing Day to overcome Australia's dominance? Team selection is the biggest issue that will be debated and, taking out Ben Stokes' outstanding century at the Waca, the majority of the team could all come under scrutiny. I read and hear a lot of opinions, but I take the view that you should never just make immediate knee-jerk reactions on the back of a defeat. There will be a lot of ex-professionals and the public wanting to get rid of this player and that, but opinions are easy when you are not the one making the actual decisions. Take a deep breath and think carefully what should be done. It should not be forgotten there are a lot of very good players in the England team that have done well over a long period of time, but far too many are currently not performing. The big question is when to say enough is enough and change is needed. Should changes be made for the final two Tests, or will the selectors take their time and review the situation between the end of this series and the first Test against Sri Lanka in June? When making that decision, they must consider what is best for England both now and in the near future. The individuals most under the spotlight are the senior players, those who have been the backbone of England's success for the last four or five years. Kevin Pietersen, Matt Prior, Graeme Swann, James Anderson and the form of captain Alastair Cook are all a concern, but I'd only be in favour of making one or two alterations rather than opting for sweeping changes. Whatever is done, there is much to be taken into consideration, not least the state of the dressing room. What is the mental state of the players? How are they coping with their run of poor form? Are they dealing with the scrutiny and the pressure of underperforming? On top of that, the selectors must weigh up if the potential replacements can perform any better than those already in the team. Will Monty Panesar fare better than Swann? Is Jonny Bairstow a better option than Prior? Will Gary Ballance get more runs than Pietersen? If Stuart Broad doesn't recover from his foot injury, would you leave out Anderson? These are the questions that the England management will ask, and then must come up with the right answers. As a player I have been in a similar situation - in 2002-03 we got ourselves off the floor and won the final Test in Sydney to avoid losing 5-0. You could ask how we turned it around, how we improved and changed our attitude to make sure we were not the first team to suffer a first Ashes whitewash in 82 years. The answer then is the same as it will be now. It's not be about the captain or coach standing up giving Churchillian speeches, but rather individuals taking responsibility for what has already happened. There has to be brutal honesty, an acceptance that they haven't performed and then clear thinking of how to turn it around. After all, you are playing for your country, there is pride in pulling on that shirt. The players, like the supporters are not impressed with what they have seen from this England team so far, but the players are the only ones that can make a difference, and they will know they must do everything humanly possible to change things around. If England largely stick with the same side and the players still don't produce the goods, then those players must understand that their immediate international futures are under severe threat. The future of team director Andy Flower has also come under the spotlight following this Ashes loss, but, in my opinion, he should still remain in charge. He is England's most successful coach of all time, and should continue in the job while he still has the appetite for the role. We have lost the Ashes, but is now really the time to rip everything up and start again? 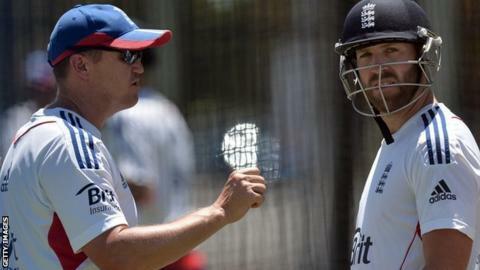 Read more on Ashes 2013-14: Where has it gone wrong for England?